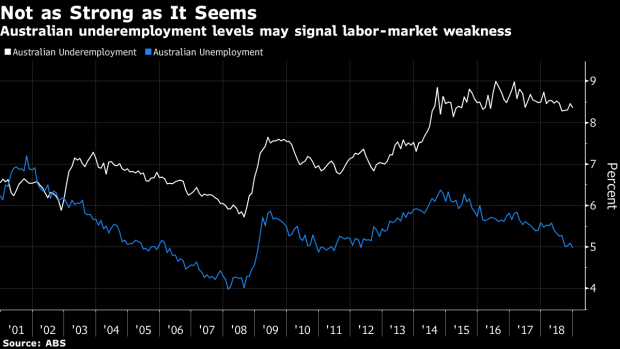 (Bloomberg) -- Signs are emerging that a two-year hiring burst that cut Australian unemployment by almost a percentage point is starting to cool. Labor market resilience has been central to the Reserve Bank optimism, but the prospect of slower hiring and a jobless rate drifting higher would make it tougher to maintain its “glass half full” approach. Such a turn would erode the likelihood of faster wage growth and inflation heading back toward the midpoint of the RBA’s 2-3 percent target. Then there’s the general election that’s set to be called by May. In the lead up to recent ballots, business has hunkered down on hiring and investment to await the electorate’s verdict. “The labor market appears to be starting to slow and inflation remains MIA,” said Shane Oliver, chief economist at AMP Capital Investors Ltd. in Sydney, who in December switched to calling an interest-rate cut. “But the RBA is likely to prefer to see what sort of tax cuts/fiscal stimulus will flow from the upcoming April budget and the outcome of the election” before it eases. Governor Philip Lowe last week dropped a tightening bias in favor of a more neutral policy stance and the RBA downgraded its growth forecasts amid concerns about the strength of consumption and the prospect of tumbling property prices further damping spending. The central bank has kept rates at a record low 1.5 percent since August 2016, with core inflation holding below the bottom of its target range for the entire period -- even as the jobless rate has fallen. Unemployment is currently holding at 5 percent and the RBA forecasts it to gradually move a bit lower, which would mitigate against any easing. But, as the following three charts suggest, that might not be how the story unfolds. Even as unemployment declined, under-employment has remained elevated, signaling that workers are unable to secure as many hours as they would like. This supports the view that the market isn’t as tight as a 5 percent jobless rate might have suggested in the past. Furthermore, in the major east coast states of New South Wales and Victoria, the rate is closer to 4 percent and there still isn’t much evidence of wages strengthening. Underscoring the points in the previous chart, the gap between unemployment and under-employment is now the widest in decades. Moreover, the initial widening -- as the former fell and the latter rose -- coincided with a slowdown in wage growth, showing just how influential under-employment has been. For the RBA, this chart is probably the most worrying. It shows that job advertisements have begun falling on an annual basis, a turnaround that historically coincided with the trough of a decline in unemployment. Given the weakness of recent data and the fact the labor market is a lagging indicator, the slowdown may already be upon us.